If you are raising goats for meat, you may have trouble deciding which breeds are best. While any breed of goat can be raised for meat, specific types are bred specifically for the virtues most important for producing edible meat. For example, most meat goat species are bred to mature quickly and put on weight, with little emphasis on producing milk. While milk goats are expected to produce for a long time, it's preferable for a meat goat to grow quickly and be ready for market as soon as possible. No one expects a meat goat to live to an old age. If you are raising goats for meat, you don't need to buy a show goat—in fact, you shouldn't. Show goats and meat goats are raised in much different ways. And you don't need to buy registered stock. Most meat producers find it ideal to find a good, full-breed buck and breed him with several mixed-breed nannies. Whatever market you find for your goat meat will determine what qualities you want in the kids. 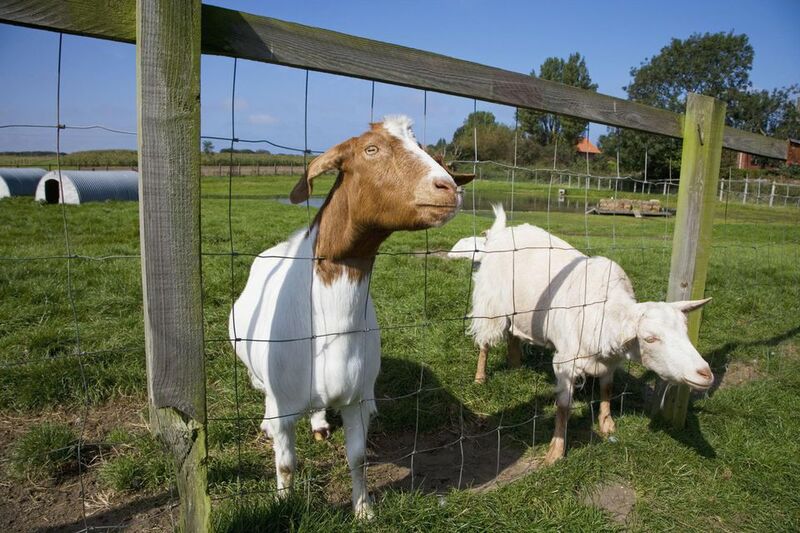 Here are some notable breeds often recommended when raising goats for meat. Boer goats were bred in South Africa for meat and were selected for their superior body shape, high growth rate, and fertility. These large-framed animals may be white and reddish-brown, or all red with short hair and black, brown, or red markings on the head and neck. Boers have short horns that are curved close to the head. They have long, pendulous ears, and are known for being docile. The Boer is highly resistant to disease, and it does well in hot, dry, semi-desert areas. Reaching slaughter maturity in about 90 days, they can reach a size of about 190 to 230 pounds for does, 200 to 340 pounds for bucks. Before Boer goats became available in the U.S. in the late 1980s, Spanish goats were the standard meat goat breed, especially in the South. These goats are descendants of the goats brought by Spanish explorers, making their way to the U.S. via Mexico. They're medium-sized and lanky, mostly short-haired, and they come in all colors. Spanish goats have long, often twisty horns. Spanish goats are sometimes considered to be more a category of goat than a defined breed. Spanish goats have been replaced by Boers as the favorite meat goat in the U.S., but they have found a new purpose—for controlling invasive brush plants, such as buckthorn. The term brush goat is a general term used to refer to various breeds and breed mixtures that are known to be adaptable and hardy, and which are useful in their capacity for eating brush and unwanted vegetative growth. They are also known as hill goats, briar goats, or native goats. Like the Spanish goat, this is not a specific breed, but rather a category of goats. Brush goats are usually genetic crosses between meat goats and dairy goat breeds. Tennessee fainting goats are, in fact, from Tennessee and are also called myotonic goats, nervous goats, wooden goats or stiff leg goats. When startled, these goats go rigid and "faint" or fall down. Myotonic goats are hardy, fertile, and have a long breeding season. Fainting goats are generally black or white, and they may be short-haired or long-haired. They are medium-sized animals, with males sometimes reaching 200 pounds. The eyes have a unique protruding quality. Somewhat rare, this species is sometimes kept as a novelty specimen or as a family pet. Large-framed, white, hardy, and able to thrive under poor conditions, the Kiko was developed in New Zealand and brought to the U.S. in the 1990s. Kikos are strictly meat-producing goats, with compact, muscular bodies and dramatic spiraling, outswept horns. Fast-growing, an adult Kiko male can reach 300 pounds. If you have a lot of range land available, Kikos may be a more economical breed than Boers, since they prefer rough grazing territory and require little attention. Bred from the West African pygmy goat breed, modern pygmy goats are kept mostly as pets, but they do have some potential for meat because they have a compact and meaty body and are fertile out of season. They typically grow to a mature size of 50 to 75 pounds for females, 60 to 86 pounds for males. A variety of solid colors and patterns are available. Pygmy goats breed frequently, every 9 to 12 months. Often, dairy goat breeds such as Nubian, Alpine, Toggenburg, and Saanen are crossed with Boers to produce animals with excellent meat. Moneymaker. Moneymakers are parented by first crossing Sannen and Nubian breeds, which are then bred with Boers. Texmaster. This is a medium breed in size, a cross between Boers and Tennessee fainting goats, developed in Texas by Onion Creek Ranch. Savanna. This breed resists heat and drought. They are muscular and have a short, white coat with a cashmere undercoat to help them stay warm in colder winters. Highly adaptable to various weather conditions, Savanna goats are a good choice for places with weather challenges. They make excellent mothers.